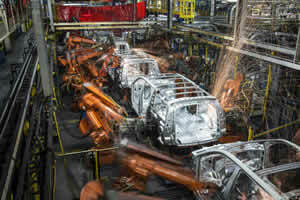 Thomas Black for Bloomberg: General Motors Co. has connected about a quarter of its 30,000 factory robots to the internet, and the largest U.S. automaker already is reaping the benefits of less down time. In the last two years, GM has avoided 100 potential failures of vehicle-assembling robots by analyzing data they sent to external servers in the cloud, Mark Franks, director of global automation, said at a conference in Chicago on Monday. Connectivity is preventing assembly line interruptions and robot replacements that can take as long as eight hours.